The COBRA-IPY project is a consortium consisting of 16 investigators from seven UK institutions and 6 project partners from three overseas institutions led by Dr. Lucy Carpenter (University of York). It includes many world-leading and internationally recognised researchers and leaders in the field of polar and/or atmospheric chemistry and physics. COBRA forms an integral and explicit part of the International OASIS (Ocean-Atmosphere-Sea Ice-Snowpack) International Polar Year programme. Throughout the Arctic and Antarctic coastal regions, episodes of rapid ozone and mercury depletion have been observed to occur every spring. These events can be sustained (occurring over periods of days to weeks) and can extend from the surface up to ~2.5 km (Roscoe et al., 2001; Bottenheim et al., 2002). Tropospheric ozone is a significant greenhouse gas and is also a critical component in the chemical life cycle of many other species, whilst mercury is a toxic, persistent and bioaccumulative pollutant. Thus these phenomena have implications for the atmospheric oxidative capacity, climate and health. The observed rapid and dramatic ozone and mercury depletion at polar sunrise (with less frequent and dramatic events during autumn) is thought to be caused by the emission of halogen species from the snowpack and sea-ice surface into the overlying atmosphere. However many aspects of the underlying chemistry and physics of this process are not well understood. It is also thought that these halogen species may also impact Arctic haze by enhancing photochemical reactions which produce fine aerosol. Since the nature and extent of snow and ice cover in polar regions is now changing at a significant rate (Yu et al., 2004), and this appears to be reflected in the magnitude and extent of ozone and mercury depletion events (Hollwedel et al., 2004), it is imperative to develop a quantitative understanding of the relevant ocean-snow-ice-atmosphere interactions, in order to predict the future state of the Arctic (and Antarctic) atmosphere and its relation to climate, health, and environmental change. Such improved knowledge is also relevant for processes occurring in lower-latitude winter environments. To address these issues, COBRA made a comprehensive range of gas and aerosol phase measurements, with a focus on halogens (BrO, Br2, BrCl, IO, I2, halocarbons, elemental nucleation mode iodine by number). The ground-based campaign was made in conjunction with flux (chamber) measurements of I2, halocarbons and particles from artificial leads/frost-flowers created on the sea-ice, and characterisation of the sea-ice surfaces. The project was underpinned by laboratory measurements of trace gas emissions and ozone destruction from/on synthetic frost flowers, and 1D and 3D modelling, the latter utilising remotely-sensed sea-ice information. A regional map of North East Canada showing the location of the Kuujjuarapik measurement site on the coast of Hudson Bay. 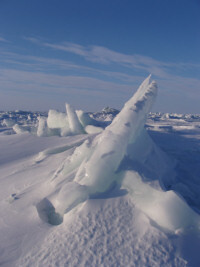 The measurement campaign took place during February 2008 and March 2008, at Kuujjuarapik, on the south east coast of Hudson Bay in Quebec, Canada. The project was based at the Centre d’Etudes Nordique Whapmagoostui-Kuujjuarapik research station operated by Laval University, Montreal with measurements being made at the research station, and a temporary site on the coast a few kilometres away. The coastal site consisted of two container labs on the shore with additional measurements being made approximately 300m out on the sea ice.